Almost 30 years ago I was a boy screaming for Hulk Hogan to punch Paul Orndorff in the face at the Spectrum. Mr. Wonderful played me and 20,000 others like puppets. I just hoped the WWE Hall of Fame wrestler didn’t remember those death wishes when we sat down for an extended interview with Paul Orndorff. One of the most memorable wrestling heels of the 80s was “Mr. Wonderful” Paul Orndorff. Orndorff had the physique, the talking, and the in ring skills that allowed him to contribute great things to the 80s WWF wrestling boom. “Mr. Wonderful” was truly ahead of his time. In watching back videos of Orndorff 29 years later, his greatness becomes immediately evident. Orndorff was such a great heel, that he could get 20,000 fans on their feet by simply taking off his ring robe. As a wrestler, his grasp over the crowd would continue and whether he was in there with Hulk Hogan or S.D. Jones, Orndorff turned his opponent into the biggest hero of the night. Ironically what I expected to be a brief yet fun wrestling interview turned into an hour long in depth conversation or what some may call an extended Shoot Interview. The WrestleMania 1 alumni was just as brilliant on the phone as he was 26 years ago when I made my dad take me to the Spectrum and watch him go toe to toe with Hulk Hogan. Eric Gargiulo: Paul, it is truly an honor to speak with you. As I have said to you over the phone, I really do feel that you were one of the greatest if not the greatest heel of all-time and it is an honor to be speaking with you. Paul Orndorff: I loved that introduction. Everything you said. Eric, see you’re a man that knows, and there are people out there that know the truth. There is no doubt about it, I should have been the world heavyweight champion of the WWF and you are exactly right. Eric: You really should have been. I have been watching a lot of old tapes recently and watching your matches from a different perspective, a mechanics perspective, and a psychology perspective, I really think you may be the greatest heel of all time. Paul: Well I appreciate that and people don’t know the energy, the work, the blood, that I put into it. I wasn’t an entertainer. I tried to go out there and do it as real as it could possibly be done, better than it could be done by anybody else, none of the showboating, no golden robes, all this stuff when you walk out and whoo this and whoo that. I didn’t work that way. I was a street fighter, always had been when I was growing up, played high school football, junior high football, college football scholarship, drafted by the New Orleans Saints, I was the real deal. It just goes to prove to you people out there and a lot of you other guys out there, you young people that just because you are the best at something you don’t always get what you want. That was very frustrating to me, to work so hard, to be in the gym, to be you know, have it all. Looks, I didn’t have to dye my hair. I wasn’t bald headed, I wasn’t fat I mean I should have had it. Yet, you have people, these promoters that do the opposite because somebody stands up for what they think are right or wrong, and that’s where I stood at. I’m too serious I guess. Eric: You bring up an excellent point because when I watch your matches they do look as if you are in a fight. I want to bring up something one of your peers, Tito Santana said about you in an interview. Tito thinks that the problem with Hulk Hogan was the first time around, he didn’t draw money like Bruno (Sammartino) and (Bob) Backlund did on the rematches. However, when Hogan was wrestling Paul Orndorff, you guys drew so much money. You were the best drawing opponent for Hogan because you were the only one that had the credibility where people realized and knew you could beat him. What are your thought on what Tito had to say? Paul: Well, I’ve said this many, many times about Tito Santana. Probably the best matches that I have ever had with anybody were with Tito. Tito was an ex-Kansas City, drafted by the Chiefs, Tito had the same attitude that I had in the ring, same attitude. I felt the very same about him and those comments, Tito’s a school teacher now, he’s a coach, Tito’s very intelligent. Back then Tito had a smart head on him you know, Tito knew how to play the game and I just wish I could have played the game like Tito did, and also keep his honor, and Tito did that, and to his people. Eric: I remember back at the time you were hot, Tito was hot, and as a fan I always wanted to see you guys feud for the Intercontinental title. As a fan I would watch your matches and you were constantly go, go, go, and I would watch Tito’s matches which were also go, go, go, and it was a match I always wanted to see. Paul: Well you know I wish they had but they didn’t. We did wrestle against each other but I would have loved to have done that. I think that probably it would have taken away from everything else because I wrestled Tito in a couple of places and one of them was in California, L.A., and I’m telling you when I picked Tito up they were throwing oranges, they were throwing eggs, I had a guy when I had him in the piledriver, had him picked up for the piledriver, a guy jumped, literally jumped in the ring, went by security, and jumped on my back. If it hadn’t been for that guy Tito Santana would have been piledrove. The police came and it just happened to be a mess. When the guy came in the ring, just as he was there I gave him a really good kick right in the mouth, that kind of laid him out there and they got him out. Still, it interrupted our match and we really didn’t get to finish it. That was the God’s truth, what I just told you wasn’t no lie, it was true, that really did happen. We were made for each other, Hogan too. I had good matches with him (Hogan) and it is no reflection of his talent or anything, he was chosen, he was the chosen, and he did it. No disrespect to him he drew money, he drew a lot of money, he drew money with everybody, but I also think that there was a time where that if they had it done (him beating Hogan for the WWF title) and done it the right way, he would have been on a different level, even higher than he was. Maybe he would have drawn the second time around with other people, who knows? It would have been better for everybody, but yet they didn’t. Eric: I don’t have the numbers in front of me but I have to guess that if you take into account inflation, on the grand scale you and Hogan both times around had to draw more money together than just about anybody? Paul: I think so too and that’s because we did it everywhere we went. We didn’t just do it the first time, the second time, we drew consistently and our matches got better. Really I made Hogan (laughs), that simple, I made him and he knows it. But then again he made me too in a way. It was good for wrestling. 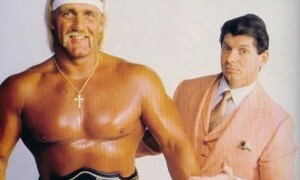 It was a lot better for Vince McMahon and Hogan than it was for me financially. That’s life. I like to do these interviews like this, that way I can express the way that I feel, and my attitudes with some things, and people. To have somebody Eric as knowledgeable as you are because I don’t do this to everybody, I’ll be honest with you. Just to feel your talk, the way you said, and the way you approach, if you’re pulling the wool over my eyes you did a good job. I kind of believe in the way you talk, and what you said, and that’s why I honor you with doing this. Eric: I have such a great respect for you that it is truly an honor to hear that. I have been saying these things about you on my radio show before you agreed to the interview. Paul: You know I hear this from a lot of people, a lot of people even to this day and you know people say all these good things about certain things. People that are really knowledgeable, you can tell some of them and I agree with them. I’m not going to say something like, “I didn’t this” or “I didn’t that” but you know I feel the same way. I worked too hard. I worked so hard for it that it was unreal. I went overboard. Eric: The thing I notice most about your matches is that the second you walk through the curtain, you were entertaining the audience. Just by the way you looked at the crowd, by the way you moved, by the timing of the way you moved, and you were so great at not only getting the audience to hat you, but to cheer your opponent like crazy no matter who he was. Whether you were wrestling Hogan or Salvatore Bellomo, the fans just wanted them to beat you, and beat you. My question is can you credit anyone for mentoring you along the way as to how be a great heel? Paul: What I did was this. Physically, the physical and the attitude, the viciousness, the meanness, and all these things, I had. Nobody gave that to me, that’s just God’s gift to me. I played football the same way. If I could knock your head off, I did, I would, and I felt good about it to tell you the truth. That’s the way I was. I can’t help that, it was just the mentality that I had. But what I did was I picked a little from this guy, a little from that guy, I listened to Bob Orton, Sr., Bobby’s father. He told me, “What you do is you get everybody to watch you. You want the focus to be on you when you get in the ring. So whatever you do you want everybody to be watching you, not the other guy.” That’s what I did, so I would do things and I knew that nobody had that type of endurance to go out there and to do this and to do that without I mean, just aggression, aggression. All of the time, aggression, and things that just made people mad. It came natural, ask my wife. My God I could do anything to make her mad, or anybody else mad. Just a little of this, a little of that, the way you move your body, and the little things that would just make the average person or anybody mad. I was good at it, too good at it. Eric: In today’s wrestling do you find that to be a lost art? I recently spoke with Sid Vicious and he was telling me that he got so much out of his career by just being able to stand there and look at a crowd. He thinks that the young guys today go out and do so much that the fans don’t even get a chance to absorb a second of it. What do you think of those sentiments from Sid? Paul: He’s absolutely right. Listen, I don’t care what generation it is, this or that, you could take Red Skelton or some of these older comedians, and you watch the timing that they had, and what they said and everything, and today they could do the same thing. You don’t have to say a bunch of cuss words, you don’t have to say this or say that to get the attention of the people. What you do is that you learn what you do, learn the art of what you are doing, and the people will get with it. What’s happened is that the promoters have let this go on because it’s easier. It’s not so much their fault, but I challenge anybody to go out, grab a hold, and work it. But I mean to work it viciously. I’m a big fan, a big fan of Mixed Martial Arts. I love that stuff, watch some of that stuff. Listen, Vince better not worry about somebody else getting into wrestling. He’s got to about UFC, that’s who he needs to worry about because they are just packing them, and that’s all that they are talking about. Because of all these off of the ceilings that they are doing now, through ladders, it’s just too much. You’ve taken the response out of the people and they sit there and watch them do a bunch of a moves, a bunch of aerial stuff, acrobatic stuff and you are doing nothing to get them into the match, to make them mad, to do this or to do that. Something that really gets them into the match, you have taken them out of the match and the only thing that they applaud on is if someone does an unreal move, it’s crazy. Eric: I have spoken a few times with Bruno Sammartino about the period in the mid-eighties when he came out of retirement. 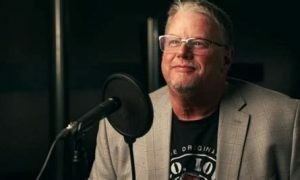 He has consistently said that you were the only wrestler that he enjoyed wrestling during that time period, and went out of his way to say good things about you. What are your thoughts and memories of wrestling Bruno? Paul: I’ve got a lot of respect for Bruno from the first day that I met him. He’s a man that says what he feels. He doesn’t back up to any of these guys, promoters and whomever else and he says what he thinks. You know if it’s wrong he will say, “Let’s try this, try that,” and hey I’m all for him. The guy drew nothing but money. Bruno Sammartino man, he’s up there with the old boxers, the old legends. His name is synonymous with anybody in the wrestling world. Madison Square Garden you think of Bruno Sammartino and I was in awe when I worked with him. We worked several shows and I could not believe it. Pittsburgh, we sold the place out. The people almost rioted, I had to have one of the agents come to the ring and get me out of the ring. Yeah, because it was getting bad because I beat Bruno’s son up and he still had it! I had so much respect for him I went in there and had a good match with him, that’s what I wanted to do, and that was the way I operated. I wanted to have good matches with anybody unless they were jerk, and then I didn’t. Eric: Did you get into any trouble when you would make references to Hogan’s lack of hair in interviews? Paul: Get in trouble? Who am I going to get in trouble with? I said what I thought. Hey, was it the truth? Case closed. Eric: You made the news following the WWE Hall of Fame ceremony when you refused to shake Hulk Hogan’s hand. Why didn’t you shake his hand? Paul: I never cared for him, you know? I don’t hate him. There are very few people that I hate. The older you get, you let that go you know? I may not like certain people, and we are all that way, we’re all different. If we were all the same we would all be living in each others houses but we’re not. He took care of himself. He was a BS’er like the rest of them and I told it like it was. Look at nowadays these interviews. You’ve got script writers that tell these guys what to say. Nobody told me what to say, I could say whatever I wanted to say. I did say what I want and if they didn’t like it, I still said it. What are they going to do, fire me? (Laughs) Turner and them would have jumped on me so quick it’s ridiculous. I would have made more money too. Eric: Why do you think people aren’t tuning in to watch pro wrestling today like they did in your era in the WWF? Paul: Talent! No Talent! Vince McMahon has no competition. Listen, competition is good. Whenever you have no competition, you can throw whatever at the people and if you don’t like it, so what? I’ve been telling people this and they have been telling me how bad the matches are and that they don’t even watch wrestling anymore. When you see a lot of people out there, supposedly a lot of people, they cut the arenas back to about ¼ of what they normally are, and you only see what they show you, and the tickets are free. We never gave away tickets! Good gracious. So, he’s got the people out there and no competition. I wish that Fox, Murdoch would get out there and start wrestling. Because if he did, with the older talent and the people out there that know about wrestling, they know how to get it back are out there. I don’t mean in the sense that they would have to wrestle but they know how to put on a wrestling show and to get the right people and it’s going to continue to be this way until these guys learn the art of the trade, and learn how to work these people. Hey, I could still go out there and make these people mad at me. It doesn’t make a difference if they know it’s phony or this or that, it’s how believable you make it look. Eric Gargiulo: What have you been up to since WCW was sold? Paul Orndorff: I have been loving on my grandbabies. I’ve been changing these poopie diapers. Listen, I have children, I have grandbabies, I’ve got great grandchildren I’m a great granddad now, I’m loving it. I love being at home, but I’m bored in a sense too. I’ve gotten hurt, all of these injuries are coming back, all in all thank God I’m okay and my family is doing great. I’m doing great. Eric: I interviewed Bill Watts a few years ago and he said a lot of great things about you. He told a great story about you and Ted Dibiase worried about being booked to wrestle for one-hour. What do you remember about that night? Paul: Oh yeah, Jackson, Mississippi, I’ll never forget it. Bill, I like Bill Watts. A lot of people didn’t like Bill Watts, a lot of people didn’t like Ole Anderson, but I liked them. They told it like it was. They treated you like you were an athlete and I liked them. I had words with both of them. No big deal, but at least they let me say what I thought and they didn’t fire me because of it, or didn’t knock me down, mess with my pay, or this or that, he (Bill Watts) didn’t do that. Bill, he put me and Dibiase together and we were two guys that just wanted to go at it man. I mean, it was me and it was him and we went at it for an hour straight. I’ll tell you what, with the amount of time that I had, the experience I had, because Ted was ahead of me. We didn’t think that we could do it and I’ll be darned if we didn’t do it, we did do it. Here again, I worked with Harley Race many times and he would go an hour. I went an hour and fifteen minutes with Harley. Just that experience to work with somebody like Harley, the experience he had, the knowledge he had, and then when you had to go out like me and Ted, you had two young bulls that went out and did it. That was how you learned, and I learned that, and I remembered that, and I remembered this and that, about that match. We just tore it up, we tore it up man, one of the best matches that I ever had. Thanks to Bill Watts. I love Bill Watts, he gave me such confidence, he let me grow, Ernie Ladd was there as his booker, first angle that I ever had was with Ernie Ladd. Ernie has passed away now and I really had a lot of respect for Ernie Ladd, I really did. That’s how you learn, I wasn’t different from anybody else, I just worked harder. Eric: You were in the main-event of the very first WrestleMania. 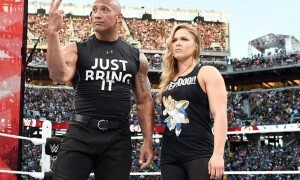 How surprised are you that WrestleMania has turned into the Super Bowl of professional wrestling? Paul: Well you know Bill Watts had that same vision when he ran the Super Dome, and I was in the main-event of two of those and worked with Bruiser Brody and I can’t think of the other go. That’s got to mean something when you are in the first WrestleMania, out of all of the people there that they could have picked. I was one of them, and that’s who they wanted in it. Then well I don’t need to get into this thing you know, the belt. The belt, you know I should have had that belt. There’s no doubt about it. Eric: I don’t think there is any doubt that there was a lot of money left on the table with you not getting a run with the WWF title. Eric: One thing you did that I want to ask you about is using your robe as part of your wrestling psychology. The way you slowly took the robe off, the way your opponents would grab the robe and put it on for heat, the way you touched the robe, it was just such a great tool and you were masterful with it. Paul: Well yeah you’re right, I was a master. That’s because I watched everybody else and I wanted to be different. I wanted to be different in the ring, what I’ve done, what I said, and how I went about doing my job, and that’s it. If you did it the old, conventional way, I can tell you that I wasn’t going to, because I didn’t want to be like everybody else. I didn’t want to be like Gorgeous George. I wanted to be like him a little bit, but I didn’t want to be him the whole way because everybody had robes, and everybody had done this, and everybody had done that, you can’t help it if you weren’t born yet, but I did mine different because I had the whole deal. I had the body, I had the interview, I had the looks, I had it all, there was no where that I was weak, nowhere. That’s what made promoters mad because they couldn’t control me. Eric: I heard a story that the WWF booked you in Japan for awhile when they first signed you. Is that true? Paul: Well I was sent over there with them for about seven, eight months. At that time I was with Turner, Georgia Championship Wrestling. At this time this big feud was getting ready to happen with Vince taking over the world. The Grahams, Watts, all these places all over, all these, everywhere. The territories were having meetings, and this, and that, wanting to know what they were going to do, and they were pushing some of us to signing contracts. With Georgia, they wanted me to sign a contract but no guaranteed money or nothing, just to sign a contract. I went, “No! 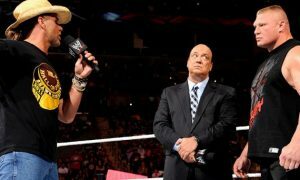 I aint signing no contract,” and then I get this call from Vince McMahon Senior, and we talked. I like gambles, I like to do something that’s different, the idea of Vince’s son taking over and having all of the big shows, all this and the visions they had, and to be a part of it. If it worked it’d be great, if it didn’t, hey listen, they’re going to hire you regardless if you are good. Of course I might have been blackballed, I don’t know but I know this. I would have still had a job up there in New York since Vince had such a strong hold up there and there was nobody going to take that territory away, he was just too strong politically and everything else. I thought it was a win, win but it was a gamble me leaving the South, but I did. And he said “I’ll send you over to Japan until we start up.” In an agreement he guaranteed me that I’d make more money than I had ever made, he guaranteed it, and I did it. That’s what happened, he kept his word. Eric: Why do you think you weren’t given such a big push when you went to WCW in 1990? Paul: Well I had gotten hurt you have to remember that I had gotten hurt. I still had to work, I still worked. I worked in the office, I did both, after getting hurt the way I was hurt it took a lot out of me. I never was the same after that to be honest. I don’t hold that against them or anything at all, although I could have been in a better position, I could have been, and I should have been. That’s okay, it’s no big deal, I have no qualms over it. Eric: How did you get hurt? Paul: It was one specific match, it was in Canada. I got kicked under the chin, out of a stupid mistake on somebody else’s part. I don’t know if it was out of stupidity or what, but it was really a stupid mistake that this person made. Eric: What do you remember the fight you had with Vader in WCW? Paul: The last thing I remember is that I was kicking him in the face with my flip-flops on and it hurt. Eric: Is it true that Meng/Haku had to pull you off? Paul: Yep. Well they had a lot of people there. It was one of those unfortunate things that happened. The only thing that I am thankful for is that if my body wasn’t hurt and I didn’t have all of that nerve damage on my right, God knows I might be in jail for killing him. I am not taking anything from anybody. Eric: Paul, it seems like we just started this interview a minute ago. What a fast hour? Paul: Well, we need to do it again Eric. Thank you, if it hadn’t been for the people I wouldn’t have been anything. I truly mean that. That’s why I worked so hard in the ring, so they got their money’s worth. Note: This article was originally published in 2010. It has been re-published with minor edits.